DID YOU KNOW that…we welcomed 121 new members in 2014, from a jewelry maker in Bennington to a Creamery in Contoocook? DID YOU KNOW that… every logo item we offer members for sale (and for free) is made by a NH MADE service member? DID YOU KNOW that…The Hampton stores sold 127,900 total items for NH Made Members (1,070 different items from 126 different members)? DID YOU KNOW that…The International Regional Magazine Association based in Oklahoma held its convention in Portsmouth and ordered an assortment of member’s products for attendees? Seen here l-r back row: are board members; Mike Somers-New Hampshire Lodging & Restaurant Association; David Deziel(Treasurer)-Nebesek Marketing and Communications; Maria Letourneau-Public Service of New Hampshire; Kristine Mossey(Chair)- McLeod Bros. Orchards; Betsy Booth(Vice Chair)-Consultant; Cynthia Harrington-NH Division of Economic Development; Gail McWilliam Jellie(Secretary)-NH Dept. of Agriculture, Markets & Food; front row: Jane Lang-NH Farmers Market Association; Susan Bullock-Lakes Region Tourism Association; Diane Souther(Exec Committee)-Apple Hill Farm and Exec Committee, John Watkins(Exec Committee)-Hutchinson’s Candy & Elements of Taste Store. Additional board members not seen here include: Amy Bassett-NH Division of Travel and Tourism Development; Charlie Burke-NH Farm to Restaurant Connections & Weather Hill Farm; Amy Hall-Granite State Dairy Promotion & NH Cheesemakers Guild and Van McLeod-Commissioner, NH Dept. of Cultural Resources. 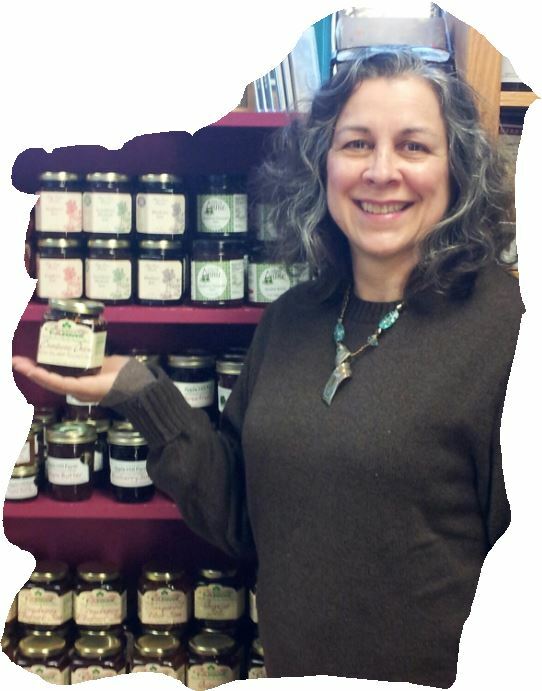 NH Store team member Catherine Pagano chose cranberry onion jelly from Fennelly Farms as her favorite product for January. Catherine says that the jelly is delicious on pre cooked roasted chicken, pork or on toast. Find this and other fabulous locally made specialty food items and products at our two NH Stores on I-95 north and south in Hampton at the state liquor store exits. ….got your attention right? Sounds magical doesn’t it? We think so and this is just one of the many uniquely wonderful things you can experience at some of our NH MADE member properties this winter! Prescott Farm Environmental Education Center in Laconia offers these. All of their winter program descriptions are up on their website:www.prescottfarm.org. You can take a Snowcoach tour on Mount Washington at the Mt Washington Auto Road/Great Glen Trails Outdoor Center in Gorham, details at mt-washington.com. Muddy Paw Sled Dog Kennel in Jefferson offers dog sledding adventures, details at dogslednh.com. Coppal House in Lee offers horse drawn sleigh rides complete with a bon fire and hot cocoa, details at nhcornmaze.com! For some indoor fun, join LaBelle Winery for free monthly readings by Granite State authors from Hobblebush Books, savor artisan cheeses and world-class wine during the reception-details at labellewinerynh.com or spend a relaxing time dining at one of our member restaurants or an overnight stay at a member bed and breakfast or grand hotel!